CANTON, MA (August 17, 2015) – One of the most anticipated times of the year for Dunkin’ Donuts fans is almost here, as the brand today announced that its famous lineup of pumpkin food and beverages will return to its restaurants nationwide over the next two weeks. To help people celebrate pumpkin’s return, this week Dunkin’ Donuts will host special “Pumpkin Peeks” celebrations at a half dozen Dunkin’ Donuts restaurants across the country. At each Pumpkin Peeks event, the first 500 guests will be offered a free medium hot or iced pumpkin coffee, along with other pumpkin-themed giveaways. Dunkin’ Donuts is also bringing its celebration of the return of pumpkin menu items to Twitter and Instagram with a special “PumpkinGrams” program. Beginning today and continuing through August 31, fans who express their excitement for Dunkin’ Donuts’ Pumpkin Coffees and Lattes using the hashtags #DDPumpkin and #Sweepstakes will have the chance to receive mGifts so they can enjoy their first pumpkin beverage of the Fall season courtesy of Dunkin’ Donuts. For official rules and additional information, visit: http://dun.kn/1PnQDmg. 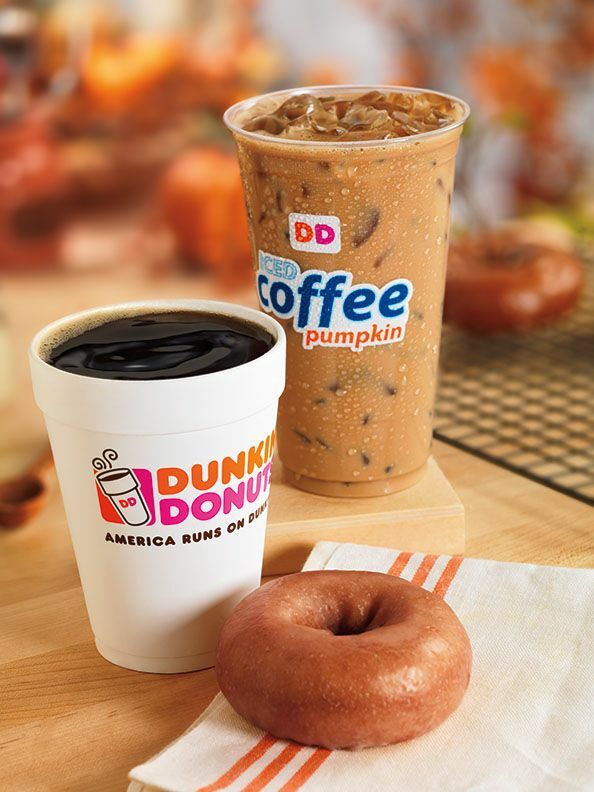 Pumpkin Coffee and Lattes: Dunkin’ Donuts celebrates the season by bringing back the taste of pumpkin to its world-famous coffee and lattes, served hot or iced. Pumpkin K-Cup® pods: Available at participating Dunkin’ Donuts restaurants nationwide and online at http://shop.dunkindonuts.com, Pumpkin K-Cup pods are available for $8.99 or two cartons for $16.99, This variety of the brand’s popular K-Cup® pods, for use with the Keurig® K-Cup Brewing Systems, allows people to enjoy the taste and aroma of pumpkin, nutmeg and cinnamon found in Dunkin’ Donuts Pumpkin Flavored Coffee in individually-sized portions at home. Pumpkin Packaged Coffee: Available in a 16 oz. size at participating Dunkin’ Donuts restaurants and online at http://shop.dunkindonuts.com, pumpkin fans can also brew Dunkin’ Donuts’ Pumpkin Coffee at home this season. The brand’s fall harvest will include even more seasonal selections for pumpkin lovers, as Dunkin’ Donuts plans to unveil new pumpkin items to its menu in the coming weeks. To be the first to know, fans can follow Dunkin’ Donuts on its official Facebook, Twitter and Instagram pages.